If you’ve grown tomatoes for more than one or two years, you’ve probably experienced wilted tomato plants. What causes the plants to wilt like that? We water them, feed them, and baby them in every way we know how, but they still find a way to wilt. There are several reasons tomato plants might wilt. The lack of water is of course one of them. However, if you’ve been watering the plants and they still wilt, it’s likely the plants are sick. The most common diseases that cause tomatoes to wilt include fusarium, verticillium, nematodes, and bacterial wilt. Some tomato varieties have an inherited genetic resistance to certain diseases. When you look at a seed packet or in a seed catalog you will often find letters after the variety name. These letters represent the diseases to which that variety is resistant. For example, I found ‘Celebrity’ with the letters F, N, TMV, and V after its name. The letters stand for F (Fusarium wilt), N (Nematodes), TMV (Tobacco Mosaic Virus), and V (Verticillium wilt). As hard as I looked through all the seed catalogs, I couldn’t find a tomato with resistance to bacterial wilt. Nematodes, fusarium, verticillium and bacterial wilt are all soil dwelling diseases. This means they stay in the soil often lying dormant for years, waiting for the right plant to be planted so they can infect the plant and reproduce. If you know what disease you have had in an area, you can select a variety that is resistant to that disease. So what if the disease you have had in the past is bacterial wilt? When would you be able to plant tomatoes back in this garden plot? A three-year or longer rotation is recommended for soils that are known to have bacterial wilt in them. 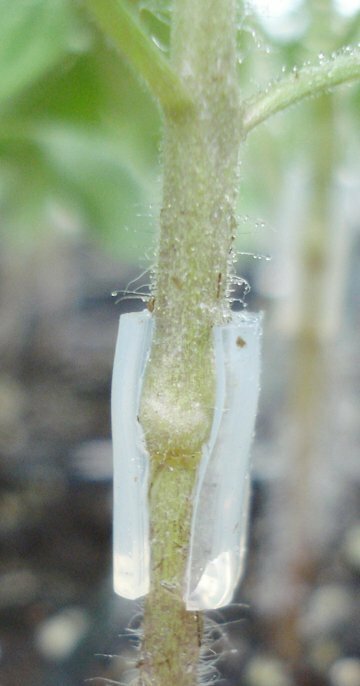 There is rootstock seed available for grafting tomatoes that have resistance to bacterial wilt. This is one option that makes sense for those with small garden areas. The process of grafting isn’t that difficult. Plant the seed for the rootstock that has bacterial wilt resistance and the seed for the tomato variety you would like to harvest—the scion. When the plants have two to four leaves on them it is time to do the grafting. 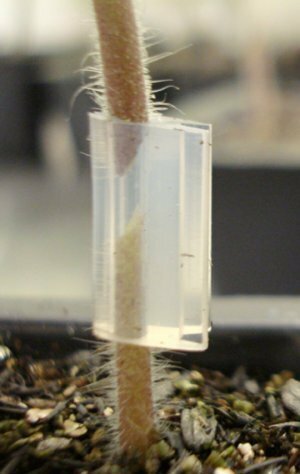 Use two plants with similar diameter stems, cut the tops off both plants and using a grafting clip make sure the two stems (the bottom of the root stock resistant to bacterial wilt and the top of the scion) are touching inside the clip. Keep the plants in a high humidity, shaded environment for a few days and then slowly reintroduce them to normal growing conditions. Presto! You now have a tomato plant with roots that are resistant to the bacterium that causes bacterial wilt, and a top that will produce the variety of tomato you love most. The roots may have an effect on the first one or two clusters of tomatoes, but by the third cluster, it’s nothing but the best. Grafted tomatoes need to be planted in the ground at the same height as they are in the container. If they are planted deep in the ground, as is a common practice with tomatoes, the top plant will grow its own roots, which are not resistant to bacterial wilt, and the plant may become infected. To maintain the integrity of the graft, the graft union must be planted well above the soil level.